Home › Christian › Keep Your Focus! 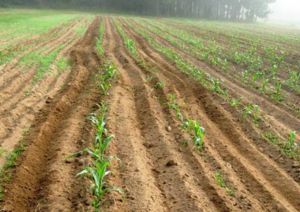 Anyone who has ever plowed or tilled a row for a garden knows that the most important rule for keeping a straight row is to keep your eye on the finish line. Now and days, there are fancy tools to help keep the rows straight, such as global positioning systems (GPS), but for us smaller home type gardeners, there is no need for such elaborate systems. Here’s what you do when starting the first row. Before ever lowering the plow or activating the tines on a tiller, find a spot at the far end of where you want the row to end up. Once you get going keep your eyes focused on the end mark. Never…and I repeat, never look to the left or the right and especially don’t look back. Instinct will naturally guide you to where your eyes are focused. So, let’s assume the path we must take to run our life’s race, is a garden row. When beginning the row our eyes are focused on Jesus; our path is straight. Uh oh! Up ahead of us we see a rock off to our right. The rock is not directly in this row lane but will be in another row coming up soon. The rock is a potential problem, a weight that has the possibility of causing us some serious trouble. After all, how big is it? It could be a huge bolder with only the top showing or it may just be a small rock that can be easily chunked. We just don’t know till we get there. What do we do? Let’s examine our possibilities. Possibility #1: We can choose to focus our attention on the rock. We groan and moan and whine and complain about that huge mountain that looms before us. We pray and pray about that rock but nothing happens. Although we tell the world that we are prayer warriors, in truth we are prayer worriers. Possibility #2: We can keep our eyes on Jesus and do not concern ourselves with the rock until we get to it. After all, worrying about it ain’t going to make it go away. And, knowing Jesus, He will have help available to deal with the problem rock at the appropriate time. Unfortunately, and for the sake of this article, we choose possibility #1. We allow the rock to become a burden. We look to Jesus and then to the rock…back to Jesus and then to the rock. We fool ourselves into believing that we are still on a straight path, but the reality is that our row now resembles the path of a drunken sailor on liberty. We are to look unto Jesus, the Author and Finisher (perfecter) of our faith (Heb 12:2). The word “author,” means the captain of, or the one who had first occasion; the pioneer leading the way. Looking to Jesus is not some cutesy little game of “peek-a-boo,” but a dogged determination that we are going to keep our eyes focused on Jesus no matter what comes our way. Jesus is the pioneer of our faith; our faith example. His row is perfectly straight with no shadow of turning. If we keep our eyes on Him, our rows are guaranteed to be straight as well. Be blessed. Wise words, I am guilty of looking at the rock instead of standing on the Rock. This has been on my heart often recently. Apparently the Holy Spirit is speaking to a lot of hearts about this issue. You bet…it was a reminder from the Holy Spirit to me as well. I appreciate and amen your post. Yet, how difficult it is to keep focused on Jesus. Peter actually walked with Him for three years, yet, in spite of Peter’s determination not to, he denied Jesus three times. It is overwhelming to think about it…overwhelming yet encouraging at the same time…if you know what I mean. Well, sir…I consider that a great compliment. Excellent post and visual picture:) Remember poor Peter didn’t have the Holy Spirit working on his behalf, but nevertheless, I bet while he wept (as I am prone to do when I fall and mess up) Peter remember Jesus’ words, “I prayed for you:)” Love your blog!! Thank you so much for the kind words. As for Peter all I can say is he had the guts to get of the boat when the others didn’t. He may have messed up royally, but he got on track.